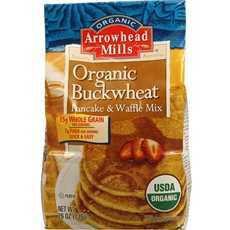 Enjoy Arrowhead Mills Pancake And Waffle Mix, Buckwheat. A Delicious, Nutritious And Energizing Start To The DayWhether It Be Traditional Pancakes Or Blinis Topped With Salmon Or Caviar, Serve Up A Great Tasting Home Baked DelightsA More Distinctive Flavor Than Wheat,Rich Source Of Fiber & Whole GrainMade With Organically Grown Whole Buckwheat (Note: Description is informational only. Please refer to ingredients label on product prior to use and address any health questions to your Health Professional prior to use.